12 pages with 37 jingles; 444 jingles directly available by pressing only two keys! "I used another program first, but starting jingles using the keyboard in TJingle is just so much easier... Pretty cool software you made!" "Complimenten voor de software. Vanaf volgende week gaan we er dagelijks mee draaien!" "I have downloaded your program TJingle and it worked great!" TJingle is the result of a lot of work. If you use TJingle in a professional envvironment, chances are that using TJingle saves you a lot of money. Although TJingle is free software, we appreciate any donations. By making a donation, you help the development of TJingle. Making a donation is easy and secure using PayPal. 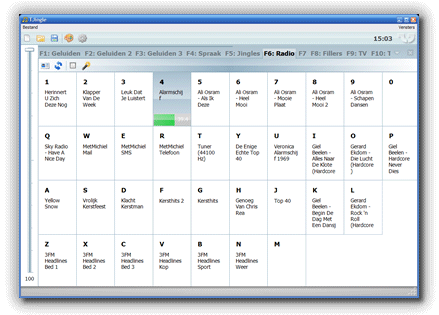 TJingle is a free jingle player that allows deejays to have 400+ sounds available just two clicks or key presses away. Based on the same technology as TJShow, TJingle is also really fast and reliable. TJingle is freely available for everybody. To work properly, it requires either Windows XP or Vista. Windows 2000 is explicitly not supported. TJingle comes with an automatic updater program, so you are automatically notified when new features are available. Download the cheat sheet to see all key-combinations you can use to control the jingles. Do you have ideas for improving TJingle? Don't hesitate to send them to us! TJingle is used for a lot of different things, so please let us know how you use it and what we could do to make the program even better. Our contact information is on this page.